Eggless banana cake recipe is a delicious and quick way to use over ripe bananas. As a result you will get a soft and moist cake to relish. 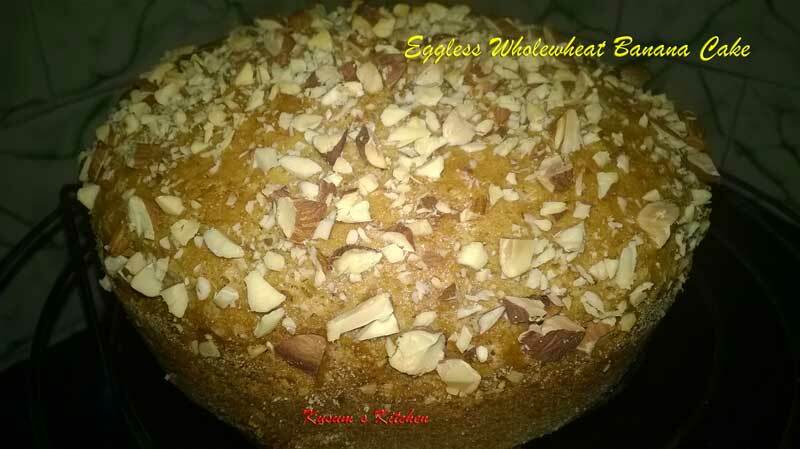 Yes the cake is eggless and made with whole wheat flour. I made this cake for the first time when my sister visited us some days after her marriage. She and her mother in law loved the cake and asked me for recipe. After that I gave this cake a second try and added chopped almonds. With every single bite you will get those crunchy almonds in your mouth and you gonna love it. I made this cake in convection mode of microwave. So lets see how to make wholewheat eggless banana cake. Preheat microwave on convection mode at 180 deg. Take a bowl and sieve all dry ingredients except sugar and nuts(whole wheat flour, baking powder, baking soda, salt) in it. Peel and chop bananas and add them in the bowl and mash them. You can use fork,blender or spoon to mash them. Now add vanilla essence, powdered sugar and oil in mashed bananas and mix well until sugar dissolves and oil and vanilla essence mixes with bananas completely. Now add and fold dry ingredients mixture into banana and sugar mixture. Add half chopped almonds to it and mix gently. Take a cake tin and grease it with little oil or butter and sprinkle some flour. Discard extra flour from tin. Now pour cake mixture into greased cake tin and tap it, so that there are no bubbles in the mixture. Add chopped almonds on the top. Now bake the cake at 180 deg for 45-50 minutes. After 45-50 minutes insert a tooth pick in middle of cake, if the tooth pick comes out clean you cake is ready, if not then bake it for another 5 minutes. 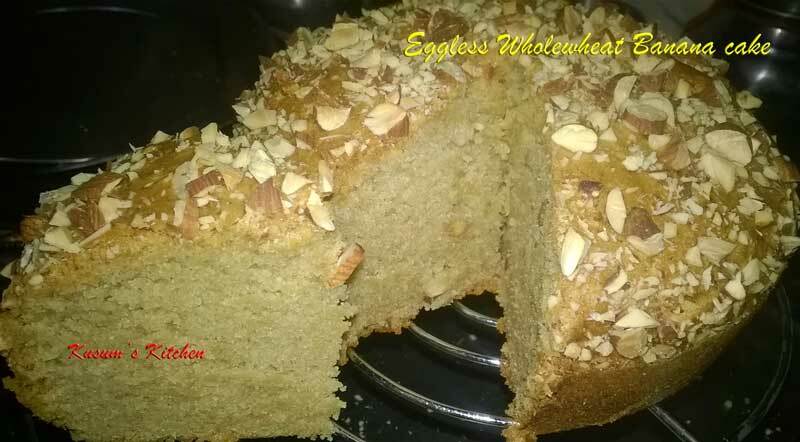 After the eggless banana cake is ready, cool it for 15 minutes. Take it out of the tin. 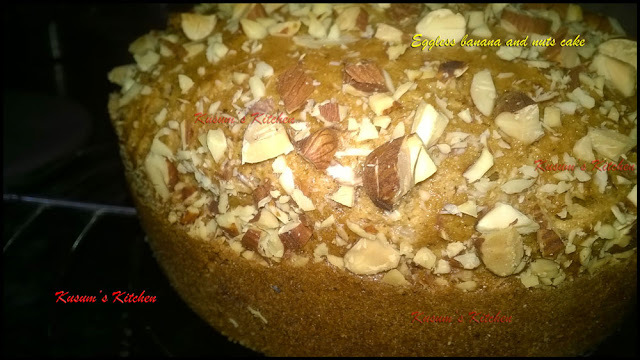 After banana cake cools down, slice it, serve and enjoy. 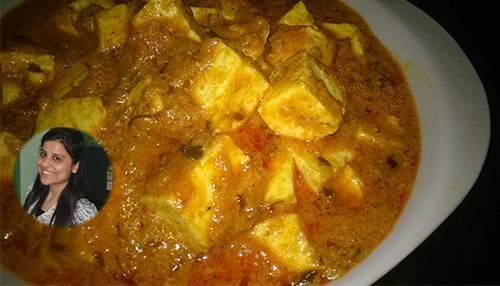 If you have any query regarding the recipe, feel free do ask in comments below. If you like the recipe so share with your friends too. You can add any nuts of your choice in the cake.